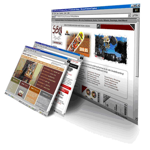 Allpro Technology offers a wide range of web site solutions. From single page personal sites to large enterprise data driven web sites. Regardless of the size of your business, Allpro Technology can help design and develop a custom web site to meet your needs. Could Your Business Benefit From A Web Site? Have you been thinking about setting up a web site for your business, but you're not sure where to start? Let Allpro Technology work with you to create a customized web site to meet your needs. A well thought out web site can be a cost effective way of building your image, finding new customers, and providing a better service for your existing customers. You can make up-to-date product information available to customers all around the world, all the time. A Web site is easier and quicker to update than printed brochures and price lists. Its capacity is almost limitless, so you can provide more comprehensive information. You could save money on printing and distribution costs as well. Improve customer service by, for example, providing answers to frequently asked questions on your Web site. Straightforward sales and information requests can be processed automatically and immediately, whether there's anyone in the office or not. Use the Web to expand your market. If you want to trade internationally, nationally, or even simply improve regionally the Web may be the most cost-effective way to do it. Get ahead of your competitors. If they don't have Web sites yet -- get in there first! If they do, study them and think of ways to make yours better! Boost your image. For small businesses, a well-designed Web site is a great way of instilling confidence, and looking bigger than you are! Prices will vary based on each web sites specific needs. Call or email us for a price quote. Most web sites can be hosted for less than $85 per year. Hosting will be provided by a third party company. Allpro Technology will be responsible for domain registration and web site hosting setup, if required. * Flash and PowerPoint presentations can be added to your web site for a small additional fee (usually around $50). These presentations are useful for displaying both content and pictures. ** Full motion videos can be added to your web site for an additional fee (usually around $100). Full motion videos are useful when you want to demonstrate a product. *** Dynamic menus can be added to your site for an additional fee (usually around $100). Dynamic menus help simplify site navigation if your site contains several pages. If there is anything else not listed here that you are interested in, please feel free to contact us. Please note that we designed the site you are currently viewing and this site demonstrates some of the features we offer. Home Page - Our home page demonstrates a flash presentation that displays information about our products and services. Insulator Video Tour - Our Insulator Video Tour page demonstrates a full motion video that is used to introduce our Allpro Insulator software. Entire Site - Our entire site uses dynamic menus for navigation. For example, if you select "Services" from the menu at the top of this screen you will see a list of all the services we offer. When you select one of the options from the drop down menu you will be directed to the selected page. Atkins Electric provides commercial, industrial, and residential electrical services. Atkins Electric will bring a professional yet personal touch to your project from simple machine moves to brand new industrial construction and installations including fire alarm systems, low voltage lighting control solutions and network cabling including fiber optic cabling. Brown's Tree Farm has been growing and selling Fresh, Real Christmas Trees for over 35 years! They are proud to now offer online purchasing through "atreetoyourdoor.com". This web site offers the easiest way to Buy a Real Christmas Tree Online. The Beem Fence Company offers the highest quality fence installation equipment and fence installation service available. Located just minutes from Rivertown Crossings Mall, Metro Health Hospital, and all major highways, Chateau Village in Wyoming Michigan, will meet your needs. When you’re home, quiet country living awaits you. Nestled in a beautiful wooded setting with nature trails and scenic views, your apartment will be your own private get away. Spacious layouts with tons of natural lighting include washers and dryers in each apartment. Chateau Village is the comfort and convenience you’re looking for-quality built just for you! Beginning in 1920, the Ebels family has been operating their store in the picturesque small town of Falmouth, Michigan. Successive generations have operated Ebels General Store for 5 generations. Gene’s Inland Marine is located in Lake City Michigan 10 miles east of Cadillac. They have been in the marina business since 1983 and have provided a variety of marina services to many areas in northern Michigan. Gene’s Inland Marine offers service to all areas within a 50 mile radius of Lake City Michigan. Don Hower Auctioneers - "Our Service Doesn't Cost - It Pays"
Don Hower-Auctioneers is a family owned business located in Lake City, Michigan. They have been in the auction business since 1967 conducting any and all types of auctions, including antiques/collectibles, estates, household, farm and liquidations. If you are interested in having an auction, contact Don Hower-Auctioneers for a free consultation. Lake Township in Missaukee County, Michigan was organized in 1883. The Lake Township hall is located at the corner of Dickerson Road and Kelly Road. The original township hall was a two-story building built in 1884 in the Village of Jennings. The second story of the original township hall was moved to the present site in 1924. Life Skills Psychological Services, P.C. Cadillac area psychological services have been provided by their office since 1977. A broad range of psychological interventions are utilized to provide problem-specific services to the full age span from small children to older adults. Over the years more than 6000 individuals, couples, and families have received help at their office. These include people from all walks of life. McLain Transmissions was started in 1998, by Doug McLain, as a division of Carrigan Auto Service, in Lake City, Michigan. In 1999, he moved the business to Cadillac. He was in Cadillac for five years, before moving to their current location in 2003. To better serve their customers, they built a four bay shop on the corner of LaChance and Rosted roads, between Lake City and Cadillac. Three of their four bays have hoists, which allow them to work on everything from compact cars to cube vans. The fourth bay is for motor homes, or repairs that do not require a hoist. The purpose of the Manistee County Sport Fishing Association is to help and promote the Sport Fishery and tourism in Manistee County by: 1. Establishing the economic contribution of the Sport Fishery to the Manistee area economy. 2. Developing a liaison with State & Federal fishery management agencies to insure the maintenance and the growth of the local sport fishery. 3. Cooperating with local and State tourism organizations to develop an action plan to promote and market Manistee area sport fishing. 4. Acting as a mechanism of education and information between area Sport Fisherman and business members. 5. Insuring adequate financing to accomplish the aforementioned goals and other objectives of the association. The Missaukee Sentinel is a weekly newspaper that has been serving Missaukee County and the surrounding areas since 1990. Their focus is on local, community news. Publishing on Fridays, the paper is delivered by mail to subscribers throughout Missaukee County, Michigan and across the country and is available on newsstands at stores and restaurants in Lake City, McBain, Falmouth, Moorestown, Merritt, Manton and Houghton Lake. Start Christmas Tree Fundraising helps schools, churches, non-profits, and other organizations raise funds for their projects by providing them with access to fresh cut, real Christmas trees that they can sell to their supporters for exceptional profit. Strike Hopper is owned by Jackson Contracting. Jackson Contracting has been in the concrete construction industry for over 38 years. This extensive experience lead to conception of the Strike Hopper...born of a need and developed for a task.